Product information "Blomberg KFD4952XD Frost Free Side by Side in Stainless Steel"
With a capacity of just over 600 litres, the KFD4952XD has no problem storing all your chilled and frozen goods. The largest top and bottom style models can only hold around 400 litres. 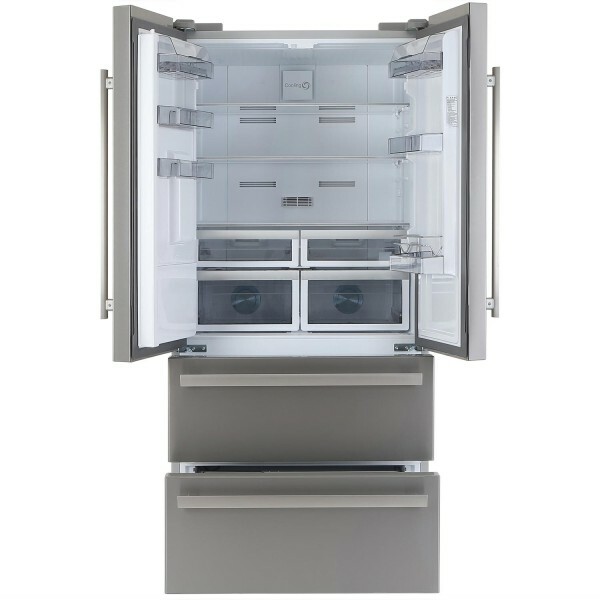 With a gorgeous French door design, this fridge freezer is simply stunning. The two side-by-side French doors open onto a large 406 litre fridge. Three glass shelves, two half-width salad drawers, a chiller compartment and multiple door racks give you complete flexibility when it comes to keeping your food chilled. The three shelves are height adjustable, to allow for bigger items, and spill proof, to stop liquid dripping to the bottom of the fridge if you knock something over. The two salad drawers are ideal for separating your ethylene-emitting fruits from ethylene-sensitive veg. And by maintaining a lower temperature, the chiller compartment is perfect for storing fresh meat and fish. Below the fridge are two freezer drawers that give you 199 litres of space for your frozen food. The slide-out drawers mean you no longer have to rummage through the food to see what’s hiding at the back. The four star rated freezer compartment uses frost free technology, eliminating the build-up of ice and bacteria. The KFD4952XD has a dual cooling system that uses individual fans – one for the fridge compartment and another for the freezer. Since the freezing air circulates only in the freezer compartment, food is frozen faster. Separate air circulation also means less temperature variation in the fridge compartment, so food stays fresh for longer. This Blomberg fridge freezer also comes with innovative blue light technology. The salad drawers are illuminated with blue light, which allows fruit and vegetables to continue photosynthesis while in the fridge. This keeps your fruit and veg fresh, so less food is wasted and you can make fewer trips to the shops. Antibacterial door seals on the KFD4952XD prevent bacteria from forming and entering the fridge, keeping your food fresh. A built-in odour filter helps remove any unpleasant smells. Quite often, it’s the little things that make the biggest difference. This Blomberg model comes with lots of little features to make your life easier. A plumbed-in water dispenser on the door provides you with chilled water and the ice maker in the freezer provides plenty of ice on those hot summer days. The LED display gives you complete temperature control, without having to open the fridge door, and for that added peace of mind there is an alarm that will sound if you accidently leave the door open. Related links to "Blomberg KFD4952XD Frost Free Side by Side in Stainless Steel"
Customer review for "Blomberg KFD4952XD Frost Free Side by Side in Stainless Steel"